A Division of Pembina Memorial Chapel Ltd.
Remembering our Mom with love and all the memories she created for her family. Doris passed away peacefully with her family by her side on April 8 at the age of 86. Missing her will be her 3 daughters; Debbie and Loren Regnier, Pam and Royce Baird, Annellen and Peter Blazuk. Cherished by her 11 grandchildren; Tim (Mandy) Regnier, Marcie (Caleb) Evans, Kathryn (Nathan) Rayner, Christine Frost, James (Kathrine) Baird, Spencer (Ali) Baird, Jenelle (Jordan) Theis, Emilee (Mike) Smith, Jordan (Johanna) Blazuk, Nick and Jeremy Blazuk along with 18 great grandchildren; her siblings Marie Jackson, Ethel (Lawrence) Zinger, Melvin (Arlene) Hepp, Ken (Gail) Hepp and Clarence Hepp. She was predeceased by her husband John Reid, daughter Cheryl, grandson David Regnier, siblings Marvin Hepp and Barbara Ann Bouma. Funeral Services will be held on Saturday, April 13, 2019 at 1:00 pm at Calvary Baptist Church and interment will follow at Riverview Cemetery. Doris was born in 1932 and grew up with 7 brothers and sisters in a farming community near Castor Alberta. 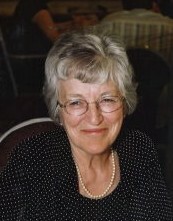 She married the love of her life John Reid in 1954. They moved to Drayton Valley in 1956 where they raised their four daughters and embraced the Drayton Valley community. Doris’s love for sewing led her to opening the “Fabric Korner” a local business for many years. She was president of the DV Figure Skating Club and one of the driving forces behind bringing summer skating to the community. She took on leadership roles in many different ways throughout the community. Doris had a deep faith that gave her strength and hope. Her faith led her to sharing her story with others through the Christian’s Women Club and many work Mission’s throughout the world. A life well lived and a family well loved! We wish to extend a special thank-you to the amazing staff at the Serenity House and Drayton Valley continuing care. Their compassion and care for our Mom is so appreciated.